"Could your next-door neighbor be a dangerous cybercriminal? Experts are touting the latest in predictive profiling algorithms, and the results may be surprising. Live from New Angeles, I'm Lily Lockwell, and this is Your News." 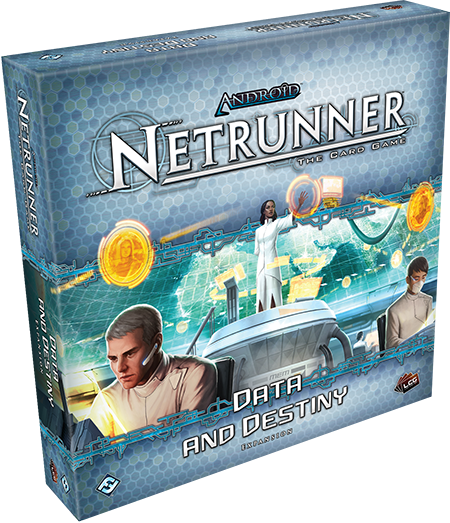 BREAKING NEWS: The Data and Destiny deluxe expansion for Android: Netrunner is now available at retailers throughout the United States. Availability in other regions may vary. 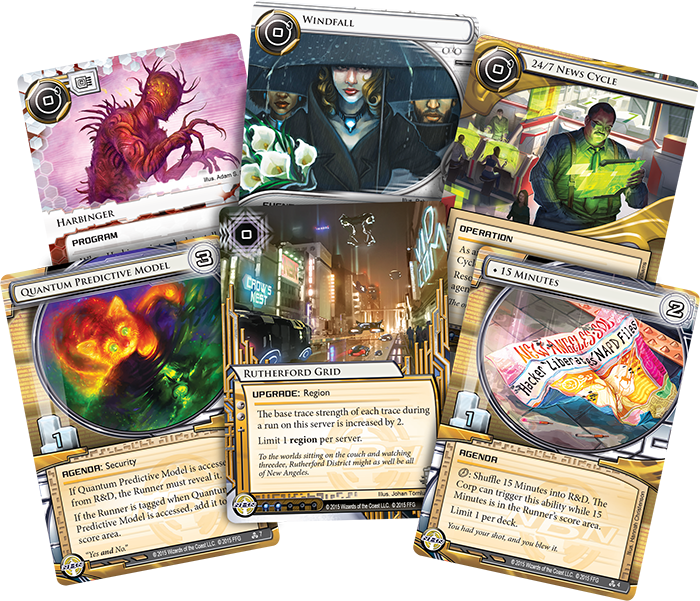 As a new wave of cybercriminals defy existing profiling algorithms, the 165 new cards from Data and Destiny (three copies each of fifty-five different cards) allow you to seize unprecedented control of your data. 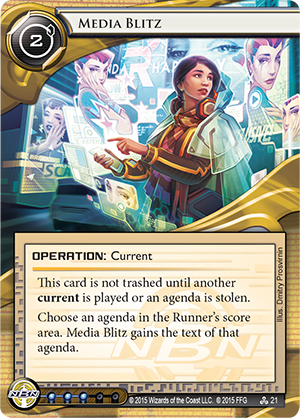 Leading the way are three new NBN identity cards, as well as a host of agendas, assets, ice, upgrades, and operations that reinforce the info-giant's position at the top of the media food chain. Among them, you'll find new ways to trace and tag your opponents, as well as new ways to use those tags. Tags are information, after all, and no one's more adept at using this information than NBN. 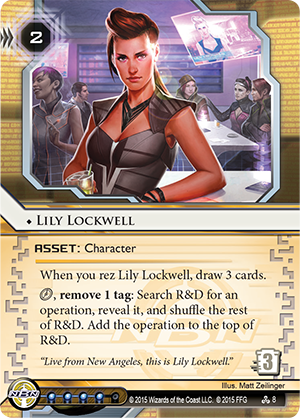 Simultaneously, Data and Destiny marks the introduction of three new Runner identities, each of which represents something of a mystery in the Android universe and forms the center of its own mini-faction. These three Runners include a bioroid whose third directive has been altered, a Globalsec security specialist hired to perform test runs on servers, and an unknown entity known only by the nickname "Apex." 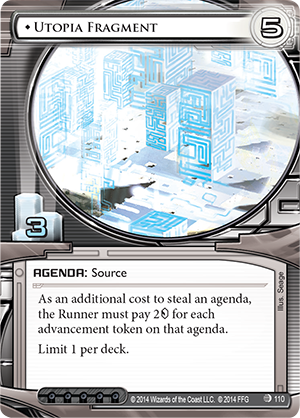 Each of these Runners and their mini-factions are accompanied by distinctive playstyles, developed to suit their unique motivations, and a wealth of new faction-specific programs, resources, and events that makes them fully and immediately playable with just one copy of Data and Destiny and the Core Set. As the world's largest and mightiest media megacorp, NBN and its subsidiaries dabble in all different types of business and use the data they collect in many different ways. 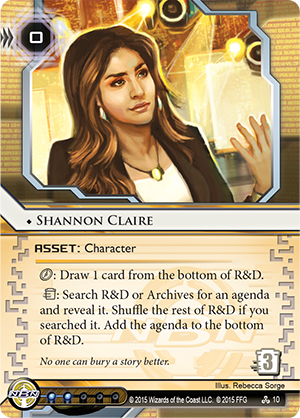 In Data and Destiny, we find these different uses of data and different business endeavors highlighted by three different identity cards. 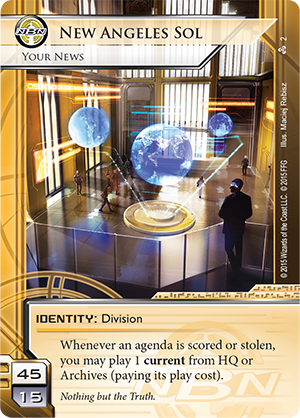 One of these is the SYNC division (Data and Destiny, 1), whose history we learned in our last preview. SYNC tends to operate behind the scenes as the silent coordinator of the Network's infrastructure, but NBN is still known for its ability to make noise, and among its many divisions, you'll find some of the world's most visible media outlets, including another of the new identities from Data and Destiny, New Angeles Sol (Data and Destiny, 2). 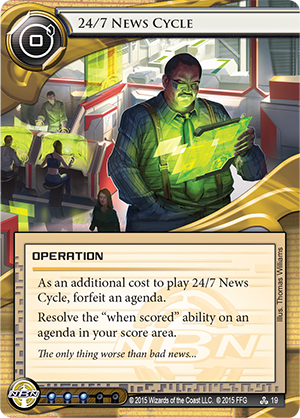 "Whenever an agenda is scored or stolen, you may play 1 current from HQ or Archives (paying its play cost)." 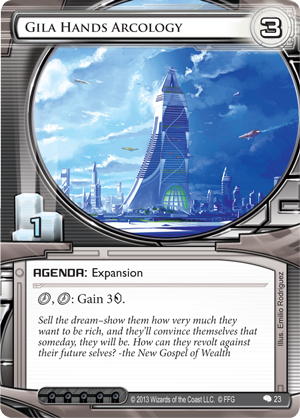 First of all, by allowing you to play a current whenever you score an agenda, New Angeles Sol can spare you a click that you can then spend toward your economy, the installation of ice, or the advancement of your next agenda. 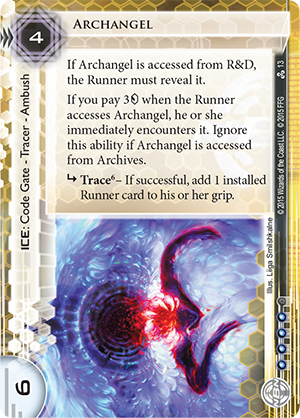 More importantly, though, New Angeles Sol allows you to keep your currents in play, so long as the Runner doesn't play one. Normally Corp currents are discarded whenever the Runner steals an agenda. 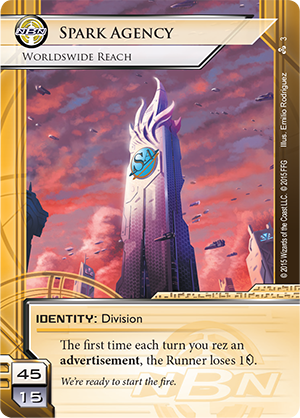 New Angeles Sol doesn't change this; however, because you control the timing of your effects, you can use New Angeles Sol to play your current out of Archives immediately after you discard it. While the current doesn't actually remain in play, the effect is virtually the same as uninterrupted broadcasting. Naturally, you will also find two currents in Data and Destiny, which you can use to complement your New Angeles Sol strategy. 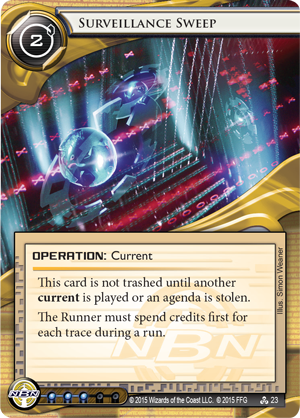 Surveillance Sweep (Data and Destiny, 23) reverses the usual bidding process between Corp and Runner during any trace attempt made during a run. 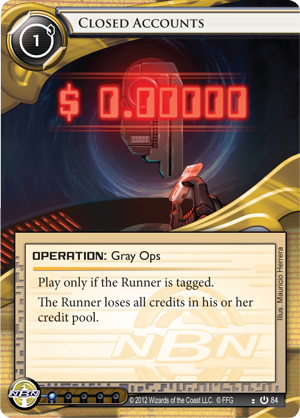 Whereas you normally must complete your bid in advance of the Runner, Surveillance Sweep allows you to bid afterward, forcing the Runner to decide how much he is willing to spend to avoid a successful trace and allowing you to decide to spend enough to succeed at the trace or skip it and bid nothing. 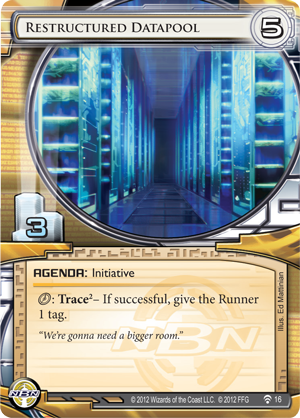 As anyone would know who had bid high in order to guarantee the success of a trace, only to watch the Runner later take advantage of your newly weakened economic state, bidding second in the trace attempt is a very, very good thing, especially when you can force a lot of traces upon the Runner with cards like News Hound (Data and Destiny, 14), Archangel (Data and Destiny, 13), and Assassin (Data and Destiny, 28). 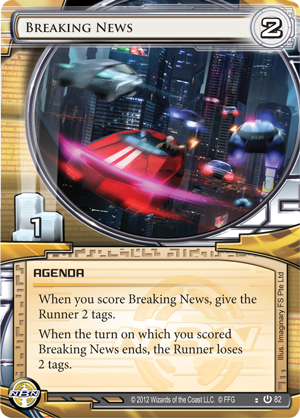 Meanwhile, Media Blitz (Data and Destiny, 21) gains the text of any agenda in the Runner's score area. 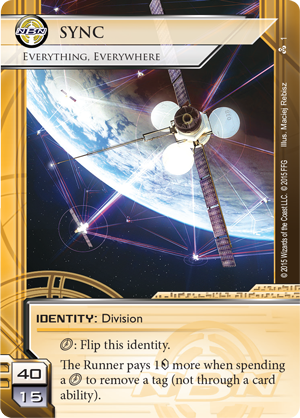 This particular current might work best for an NBN deck using the Spark Agency (Data and Destiny, 3), which derives advantages from playing advertisements, in conjunction with the agenda Rebranding Team (Data and Destiny, 6), which grants the advertisement keyword to all your assets. 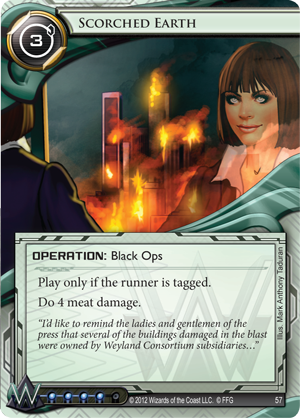 Nonetheless, Media Blitz offers your New Angeles Sol deck a great measure of security if it intends to gain economy from Gila Hands Arcology (Creation and Control, 23), bunker your data behind a Utopia Fragment (The Source, 110), or force your opponent to fend off the endless traces you initiate with your Restructured Datapool (What Lies Ahead, 16). 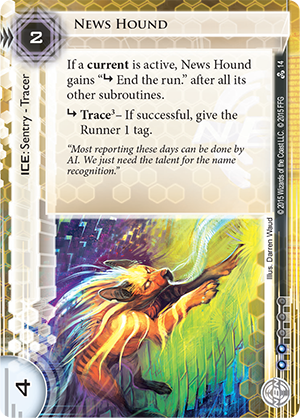 Perhaps the greatest secret of New Angeles Sol, however, is just how good the news agency is at tracking down leads. 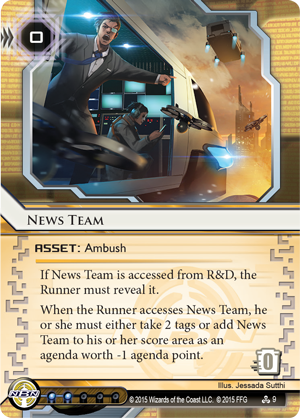 Everyone's aware of the stories it shares through Your News and other programs, but there's a lot more to the division and its News Team (Data and Destiny, 9) than makes it to your PDA. In a typical 24/7 News Cycle (Data and Destiny, 19), for example, it wouldn't be unusual for New Angeles Sol to dig up a story about some Mr. Nobody's 15 Minutes of fame (Data and Destiny, 4), follow the connections between the story and any outstanding reports of cybercrime, and then expose those connections, tagging the Runner in a Breaking News (Core Set, 82) segment. 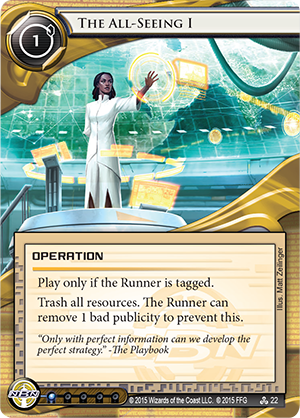 Then it might use the tags it gains in order to target the Runner with Closed Accounts (Core Set, 84), The All-Seeing I (Data and Destiny, 22), or even Scorched Earth (Core Set, 99). 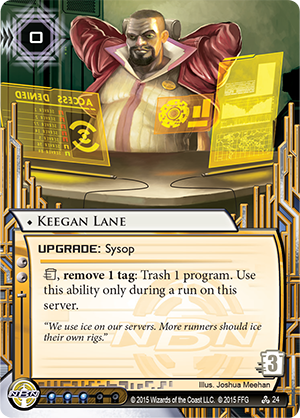 Alternatively, New Angeles Sol might just use the information it gains to set up an even larger sting, handing over the Runner's profile to Keegan Lane (Data and Destiny, 24) and allowing him to shut off a critical component of the Runner's rig in the middle of a run. How Will You Use Your Data? 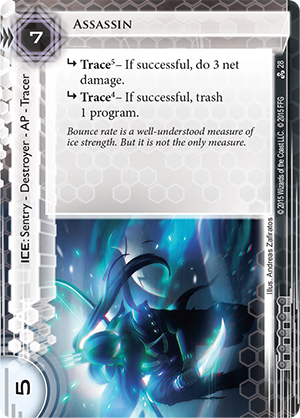 How will you make use of the new cards from Data and Destiny? 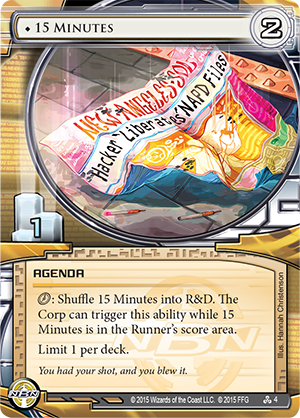 Will you explore its new Runners and their mysteries? Will you use the information that NBN collects and stores within its massive data centers to launch a worldswide, user-focused media blitz? Will you focus, instead, on supplying a growing viewership with all the latest news? The choice is yours. Data and Destiny is now available at retailers and online through our webstore. Control your data. Control your destiny!